"I knew with utter certainty that this was something I really had to do, and I would not budge." 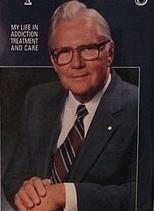 Why are we featuring the autobiography of a man who pioneered addiction treatment in Canada beginning in the 1940’s? His story is just as inspirational today to anyone who strives to achieve something new and worthwhile in a world that resists you at every step. Being at the forefront of an unpopular branch of medicine was no easy task. A pre-eminent researcher into alcoholism and mental health, Dr. Bell was forced to fight the Canadian medical establishment. Eventually he was taken very seriously and was appointed an Officer of the Order of Canada. I have a personal connection in that Dr. Bell was my wife’s grandfather and mixed a phenomenal martini. He was a humble man who built his life from a sense of contribution. Gordon Bell came close to not being a doctor when he flunked out of medical school after the death of his first love. Utterly depressed, defeated and ashamed, he returned to the family farm. A few years later, he had an experience that he could only describe as transcendental. He lost his fear of not being able to succeed and acquired a new sense of direction in personal fulfillment. With new determination, he reapplied for medical school where he was given the clear message that he was not wanted. "Can you not appreciate that you have neither the intelligence nor the emotional stability to graduate in medicine and succeed as a physician?" …said the increasingly exasperated assistant dean as Gordon Bell stood before him. Dr. Bell wouldn’t accept “no”. In frustration, the assistant dean arranged for Gordon to see a professor of psychology in the hope that the psychologist could make Gordon understand his inadequacies. Gordon saw the meeting with the psychologist as another opportunity to make his dream happen and made the best of the psychologist’s open mind thereby gaining a valuable ally who intervened in his application process and ultimately championed his acceptance into medical school. Gordon turned his lingering anger at the assistant dean into a powerful motivator; “I’ll show him if it’s the last thing I do!” His study habits improved and he received his medical degree in 1943. "...people rarely live to the limit of their abilities, and ... they possess powers that they habitually fail to use." In the early days, Dr. Bell opened his home as a clinic for people with mental health problems. To his surprise, the first people to arrive were alcoholics. Their alternative was jail or the locked psychiatric wards. Alcoholics were considered moral degenerates and hopeless cases by the medical community of the time. Dr. Bell became determined to help these people and soon became tarred with the same stigma; the attitude was, “you can disregard him; he treats drunks”. He was even investigated by his own medical association as his pioneering work was regarded as disreputable and suspicious. Dr. Bell applied the words to himself as he endured personal tragedies, professional setbacks and a chosen profession that was determined to pull him down. "Remain a student for life." Two themes had a profound effect on Dr. Bell’s life: 1) The need to “remain a student for my entire life, and not to be satisfied only with what I learned during my school years” and 2) The golden rule – to love your neighbour as yourself, but “no better than yourself”. One needs a balanced regard for oneself and others as the basis for productive interaction with people. Canadian medicine had few resources and no training on how to treat alcoholics. Dr. Bell had to learn from his patients. His patients became his teachers. These men and women were some of the most intelligent people he had met and gave him unrivalled insight into the causes and effects of their condition; they would even alert him to the tricks they would play while drunk. Dr. Bell simply listened, learned and developed an effective treatment strategy that thrives to this day. A Special Calling is a book about a true Canadian hero who wanted to help. We can relate to Gordon Bell’s childhood anecdotes and with the tragedies and joys of his life. Above all else though, A Special Calling is a story about achieving great things out of the spirit of contribution to others. This is a story of deep belief in one’s guiding principles and a determination to succeed despite, at times, overwhelming odds. Dr. Gordon Bell’s life can connect with anyone who wants to leave behind something of lasting value.